A Peacock Pansy displaying its upperside. Above, the wings are rich yellowish brown with darker brown edges at both termen and costal margins. On each of the forewings, there are four distinct costal bars, the outermost three of which are filled with darker shadings. There is a prominent ``peacock'' eye-spot in space 2 near the tornal area, and a lesser one in space 5. On each hindwing, a much larger and more prominent eye-spot is featured in spaces 5-6 near the apex. The termens of both fore- and hindwings are marked by two series of marginal striae. Underneath, the wings are duller and the costal bars are filled with paler shadings instead. 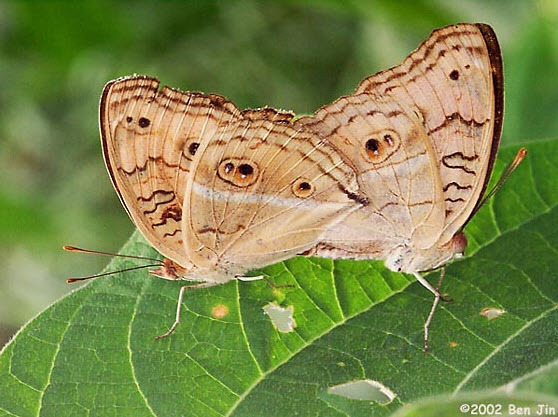 Compared to those on the upperside, the ocelli are smaller and on the hindwing, there is an additional ocellus in space 2, and the spot in spaces 5-6 appears to be a conjoined pair. Each of the fore- and hindwings has a dark stripe traversing from the costa to the dorsum. The stripes appear to be continuous across the two wings. 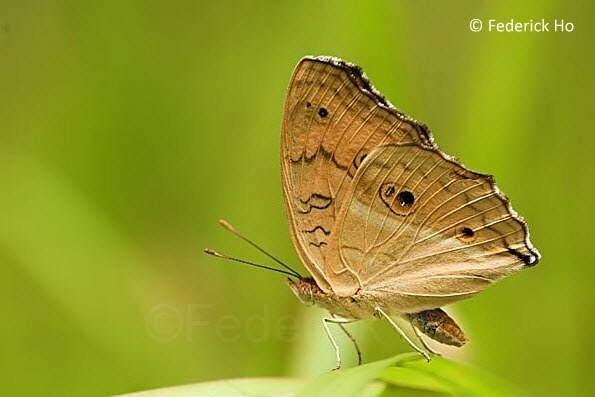 The stripe on the hindwing is outlined by a broad pale band on the inner edge. 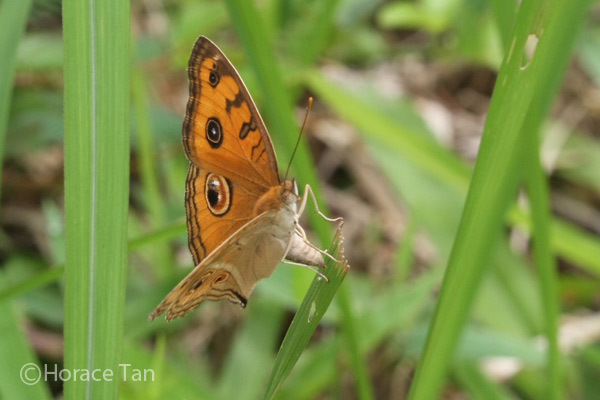 This species is rather common across multiple habitats in Singapore, with ubiquitous presence in open areas in the nature reserves as well as urban and suburban areas. 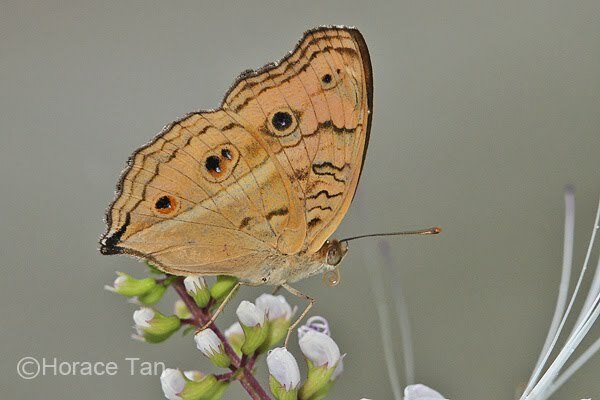 It flies in the usual gliding manner of the Junonia spp. and typically several individuals can be seen together in one location. Under sunny condition, they have a habit of opening their wings wide to sunbathe while resting on a perch. 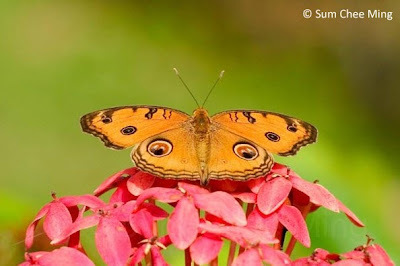 A Peacock Pansy visiting Ixora flowers. A Peacock Pansy giving us a view of its underside. Caterpillars of the Peacock Pansy feed on leaves of the the recorded local host plant, Ruellia repens (Acanthaceae) which occurs as widespread weeds in Singapore. 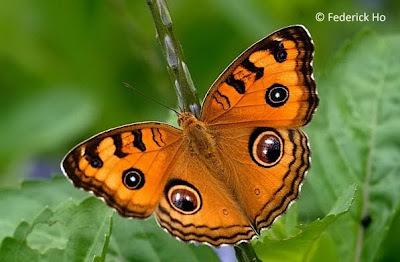 It is likely that Peacock Pansy utilizes more members of the same plant family as larval food plants. 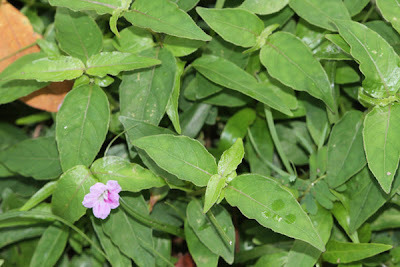 Local host plant: Ruellia repens. A mating pair of the Peacock Pansy. A mother Peacock Pansy laying an egg on a grass blade. 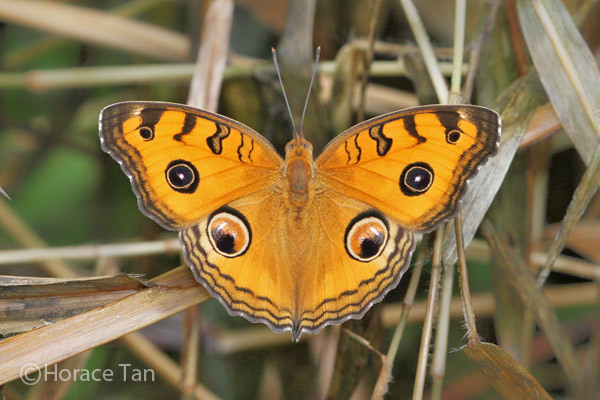 The eggs of the Peacock Pansy are laid singly on leaves or shoots of the host plant and rather frequently, on plants of other species in the vicinity of the host plant. The greenish egg is somewhat globular in shape but with a blunt top. Eleven to thirteen raised whitish ridges run from the top to the base of the egg. Each egg has a diameter of about 0.75mm. 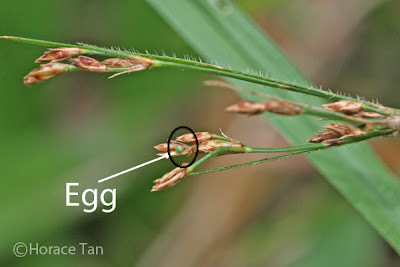 An egg of the Peacock Pansy laid on a grass inflorescence. 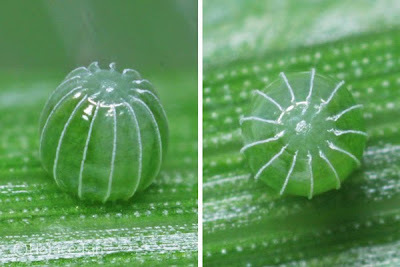 Two views of an egg of the Peacock Pansy. Diameter: 0.75mm. 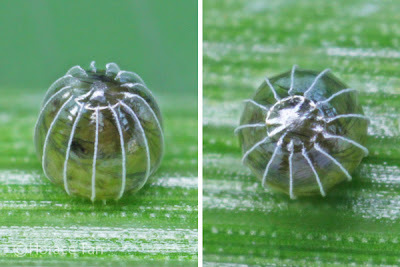 Two views of a mature egg of the Peacock Pansy. The egg takes about 2.5-3 days to hatch. The young caterpillar emerges by eating away part of the egg shell, and then proceeds to eat the rest of the egg shell from the outside. The newly hatched measures at about 1.5-1.6mm. The cylindrical and pale yellowish green body is covered with many small tubercles. Long dark setae emanate from these tubercles. The head capsule dark brown to black. If the egg was not laid on the host plant, the newly hatched will have to make its way to the host plant in the vicinity. 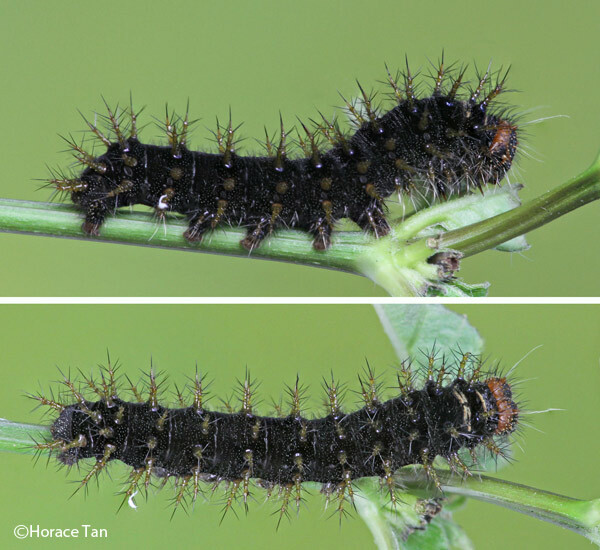 The 1st instar caterpillar has a preference for the lamina of young leaves or emerging shoots of the host plant. After reaching about 3.2mm in 2 days, the caterpillar moults to the 2nd instar. 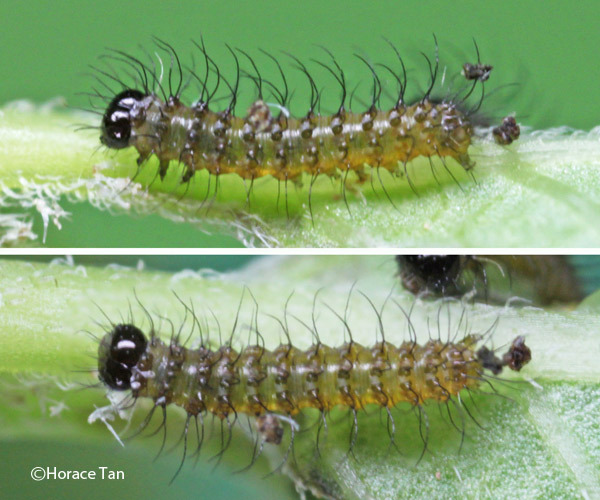 Two views of a 1st instar caterpillar, length: 2.5mm. 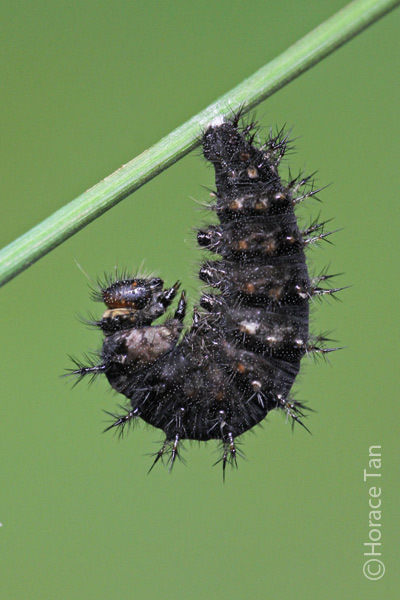 The body of the 2nd instar caterpillar is dark brown to black. Moderately long and branched brownish processes run along the length of the body. Fine setae emanate from these processes and from other small tubercles on the body surface. The head capsule is still black to dark brown in colour. 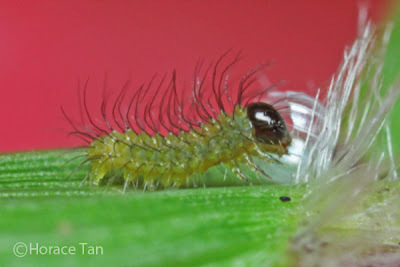 This instar lasts about 2 days with the body length reaching about 6mm. The 3rd instar caterpillar has proportionately longer dorso-lateral and lateral processes. The base of most dorsal and dorso-lateral processes are colored in yellowish to orangy brown. The body is mostly dark brown to black with a fair number of numerous thin rings, pale whitish and inconspicuous, appear on the body segments. 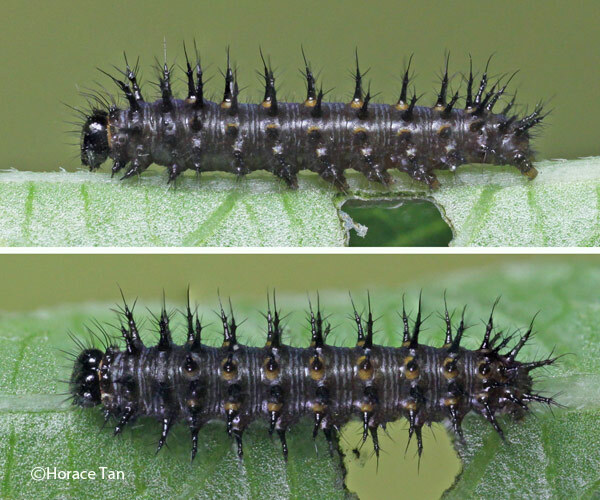 This instar takes about 2 days to complete with body length reaching about 11mm. The 4th instar caterpillar closely resembles the 3rd instar caterpillar. More conspicuous at this instar is an orangy collar which appears immediately after the head capsule, and white collars between the thoracic segments. The 4th instar lasts about 2 days with the body length reaching about 16.5mm. Two views of a 4th instar caterpillar, length: 16.5mm. The 5th (and penultimate) instar caterpillar is similar to the 4th instar caterpillar. 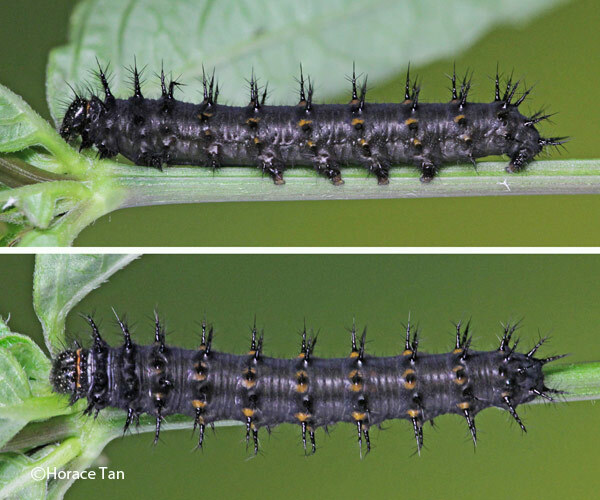 This instar lasts for 2-3 days, and the body length reaches up to 25mm. 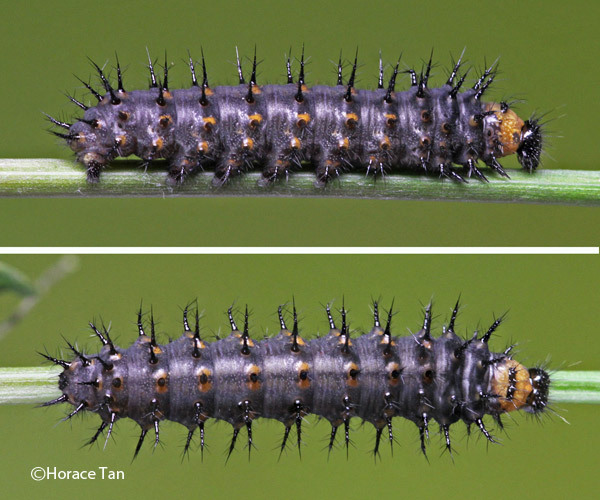 Two views of a 5th instar caterpillar, length: 25mm. 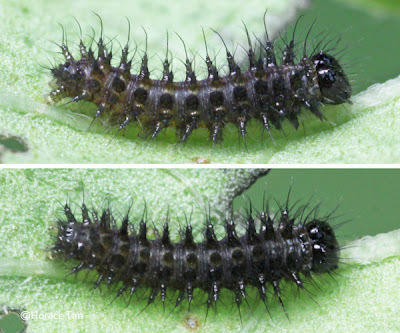 Two views of a 5th instar caterpillar, about to moult, length: 24.5mm. The 6th (and final) instar caterpillar has a few visible changes to its body features. 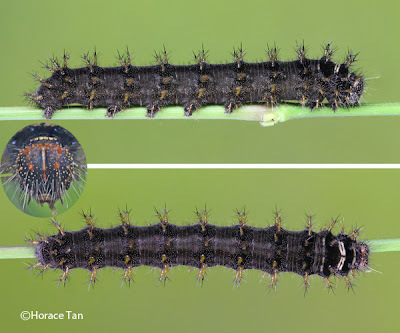 Now it has a dense carpet of whitish fine setae on the body surface and more prominent white collars on the thoracic segments than in earlier instars. 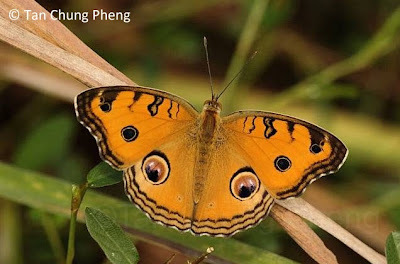 In the head capsule, the periphery and some of the conical tubercles are now colored in orangy brown. 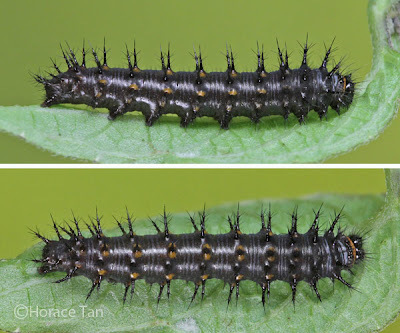 Two views of a 6th instar caterpillar, early in this stage, length: 25mm. Two views of a 6th instar caterpillar, late in this stage, length: 43mm. The 6th instar lasts for 3-5 days, and the body length reaches up to 43mm. On the last day, the caterpillar ceases feeding and wanders around. Eventually it stops at a spot on the underside of a leaf, young shoot/stem and spins a silk pad from which it hangs vertically to take on the pre-pupatory pose. A pre-pupa of the Peacock Pansy. The pupation event of a Peacock Pansy caterpillar. Pupation takes place about 0.5 days later. The pupa suspends itself from the silk pad with no supporting silk girdle. 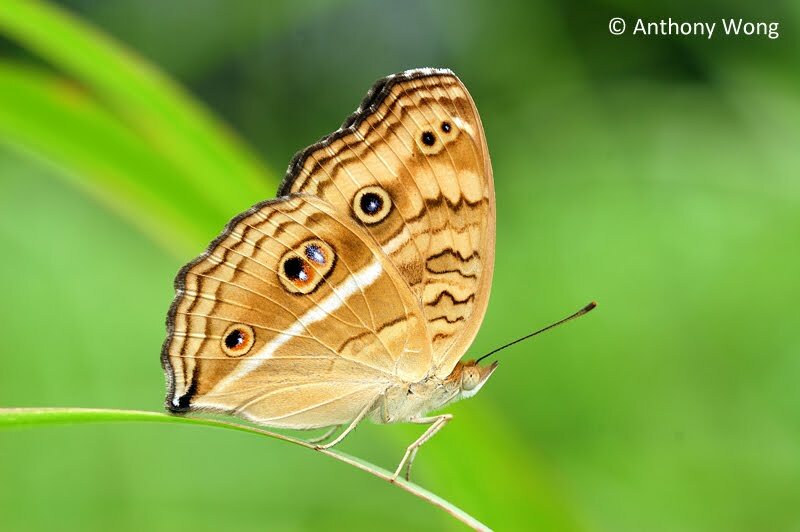 It is brown with a number of large white bands or patches. There is a series of dorso-lateral pairs of short and pointed processes, one pair to each segment. The dorsum is sharply raised at the mesothorax. 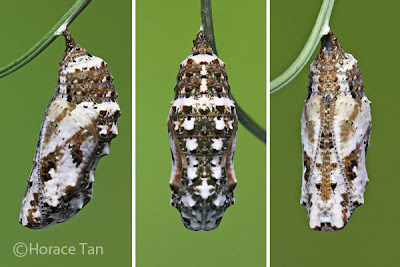 Length of pupae: 18-21mm. Three views of a pupa of the Peacock Pansy. 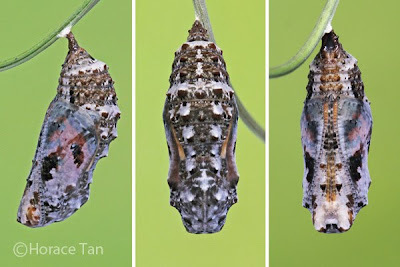 Three views of a mature pupa of the Peacock Pansy. 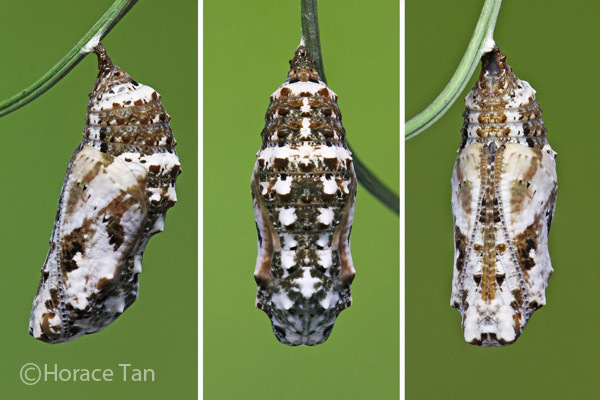 After about 5.5-6 days of development, the pupal skin of the mature pupa turns translucent and the pupa turns dark brown as a result. Patches of orangy brown can also be noticed in the wing pad. The adult butterfly emerges from the pupa within the next 6-12 hours. 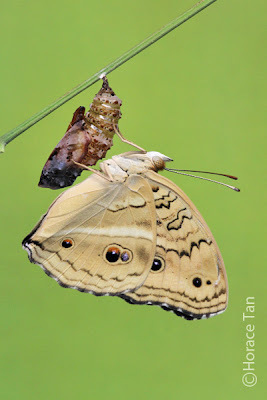 A newly eclosed Peacock Pansy resting on its pupal case. Awesome pics and a nice narrative! Photographs and the narratives are awesome.